(Bloomberg) -- Australia’s three-year bond yield fell below the central bank’s policy rate for the first time since September 2016 as a slowing economy fuels bets for an interest-rate cut. Yields on three-year debt -- more sensitive than those on longer maturities to central-bank rate moves -- dropped as much as four basis points to 1.499 percent. The Reserve Bank of Australia has kept its cash rate target at a record-low 1.50 percent since August 2016. Speculation the RBA will cut rates has intensified as data including retail sales and business confidence have shown the economy is slowing due to a property market slump and global trade frictions. Westpac Banking Corp., JPMorgan Chase & Co., Macquarie Bank Ltd. and UBS Group AG all predict two 25 basis-point rate cuts this year. 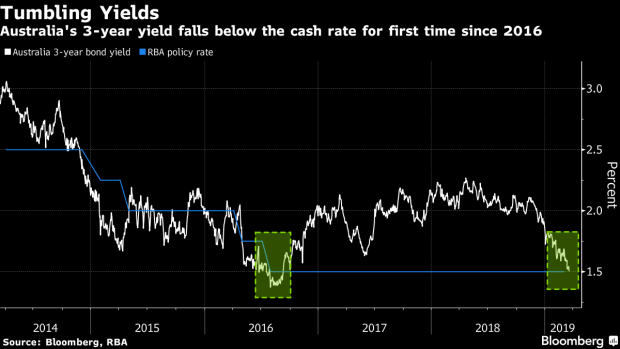 “Historically when three-years have traded through, the RBA has usually cut anywhere three to eight months after,” said Prashant Newnaha, senior rates strategist at TD Securities in Singapore. While TD expects the central bank to remain on hold, “we have recommended investors be positioned for lower yields,” he said. RBA minutes published Tuesday showed policy makers were of the view that rates should stay on hold due to a divergence between labor-market growth and a slowing economy. The central bank said the labor market was “particularly important” to its outlook and reiterated there was considerable uncertainty over consumption, according to the March 5 minutes. The RBA next meets on April 2. Australia’s bonds have returned 2.6 percent this year, the best performers among Group-of-10 economies, according to data compiled by Bloomberg. Ten-year yields fell as much as four basis points on Tuesday to 1.94 percent, lowest since September 2016.